They focus on the problem of providing a bug notification system that makes sense of errors and helps you take action in various ways. In this article, we’re going to discover Bugsnag and integrate it into an existing Laravel application. You can clone the demo app from Github to follow along. You can follow the instructions below to set up the demo application (it is assumed you have a working PHP environment like this one). Before starting to use Bugsnag, we need to create a new account and create our new project. You can start with a 30 day free trial and switch to a paid plan depending on your application’s size. After signing up, you’ll have to create a new project and specify your project type. In our case, that’ll be PHP. Bugsnag provides a list of notifiers for different application types. We’re going to install and configure the PHP notifier package. Alternatively, because the demo application is built using Laravel 4, you may want use the Laravel package and follow the Laravel integration guide to easily set up your project, but in this case, we’ll take a more framework-agnostic approach. Grab your project API key from project dashboard > settings in Bugsnag’s control panel. You can store your API key in your environment variables or inside a configuration file depending on your application. In this case, we’re going to add it to our app/config/app.php. Inside app/start/global.php, we bind and configure our Bugsnag client. The container dependency injection setup will vary, depending on your application. The above case is common for Laravel apps. This will make Bugsnag log errors only during a specific release stage of an application. After creating the Bugsnag client, you should attach it to your error handler. This will depend on how you manage errors and exceptions inside your application. Laravel provides fatal and error methods which accept a callback handler, but you can also use PHP’s set_exception_handler and set_error_handler. The notifyException method accepts additional meta data as a second parameter and the error level as a third parameter, which will default to warning. However, if you want to attach it directly to the PHP error and exception handlers. By default, Bugsnag sends the ID of the logged in user with the error, but you can change that by updating the Bugsnag client instance on the container. Now we can see the user’s username in the error details by selecting the user tab. You can also alter the error object being sent to the server by using the setBeforeNotifyFunction method which accepts a callable function as a parameter. "Metric 1" => "Some data here"
If you noticed on the screenshot above, we have a list of tabs to group meaningful details about the error. We can update existing ones like the USER tab, and add new ones for metrics, etc. To avoid sensitive details about your customers or application leaking out, you can add a list of attributes that you want to filter out to your Bugsnag client instance. The value will appear as [FILTERED] on your dashboard. After creating our Bugsnag account and attaching it to the application, we need to visit the dashboard to explore the different available components. We can choose between the Inbox view, which shows us the list of errors as a list that we can filter through, or switch to the timeline graph page by clicking on the timeline link on the top of the page. You can check the documentation for more details about the timeline graph dashboard. Inside our questions view template, we display the question owner’s username. The user being deleted would cause a problem, and throw an error. (Trying to get property of non-object). If we have a lot of users accessing the questions page (which you can simulate by requesting the same page multiple times), it could clutter our errors dashboard with the same bug. If you seeded the database using the artisan db:seed command, you’ll have a question assigned to a user with an id of 10, which doesn’t exist in the database. We don’t have to worry about repetitive errors being displayed on the dashboard, and apply any grouping to them. After parsing your errors, Bugsnag will decide if we’re dealing with a repetitive or a new error. Here is an example from our application. We can fix this error by adding a simple test before accessing the username property on the object. To investigate our errors, Bugsnag provides us with a set of filters to drill down on the data and gather specific details about the source of the problem. You can filter errors by time using the date range selector on the top filter bar, or see all errors by selecting the all filter. A better way to filter errors is by data – like user, error status, severity, assigned to X, etc. You can check the documentation for the list of supported filters. Because Bugsnag parses your error messages when you send them, it will help auto-complete the search terms for hostnames, release stage, etc. There is a good chance that you’re not working alone on your project, or you’re the project manager. You can add project collaborators by going to the top right corner and clicking the collaborators link. Bugsnag parses the errors and groups them accordingly to avoid long repetitive lists. After selecting an error, we can assign it to an existing collaborator or invite a new one. The left sidebar on the dashboard shows the list of errors grouped by status, (Open, In progress, Fixed, Snoozed, Ignored). After selecting an error, we can change its status in the top left bar. By default, Bugsnag will only show status:open errors to help us identify active errors, but we can change that using the aforementioned filters. If you have an error occurring frequently and your team is currently working on a fix for it, you can snooze it for a specific period or by using a condition. If you’d like to ignore this error – which is not recommended for production – you can do so by using the ignore button next to the snooze option on the actions menu. Teams often use multiple apps and services for their development process. Bugsnag offers a list of notification plugins that we can configure to send notifications for different types of errors. You can notify your team on Slack, create issues on Github, post to your server’s webhook, etc. Navigate to our project settings and click on the Team Notifications link to display the list of integrations, then select Slack. We need to specify when it should notify us and how often. Then, we need to get our Slack webhook URL by following the link above the input, paste the URL, and send a test notification. The other way to act on error notifications is to create a new Github issue. 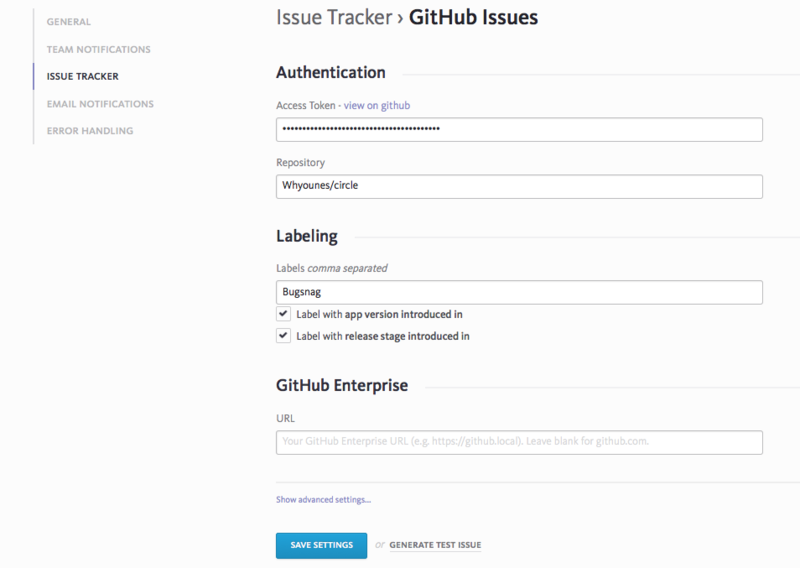 Navigate to our project settings and click on the Issue Tracker link to display the list of integrations, then select Github issues. Bugsnag provides a nice platform for automating one’s error tracking system and save the time of going through logs, creating monitoring scripts, etc. You can focus on building your application while keeping an eye on what’s happening on your production release. Bugsnag has already attracted some big companies like Github, Cisco, LinkedIn, etc. You can start by creating your 30 days trial to explore available features and switch to a paid plan if you really like it. If you’re using another error monitoring platform, or you’ve already tried Bugsnag, let us know what you think!